"Can You Handle 24/7 Happy Hour?" Probably not, but I'm going to try! During Social Media Week, I met John Wiseman from Thrillist and immediately gushed about how much I love the Thrillist emails and events. When he asked me how I had signed up for their emails, I told him I honestly had no idea! He replied that the best marketing is when your audience doesn't remember how they heard of you, but they know who you are... and that's the same way my knowledge of I'm Not At Work came about! I don't remember exactly how it happened. Probably one of the Twitter handles I follow re-tweeted a post or something. What I do remember though is doing my research on what exactly I'm Not At Work was. What I found was a card that gave you entitlement to happy hour every hour to well known bars around the city! In THIS city where a cocktail during off hours will cost you an arm AND partially a leg! I thought, sign me up! I then realized to get these great 24/7 happy hour deals you needed a membership card. Initially I was bummed. THEN as my luck might have it , I attended Thrillist's Superbowl party and the masterminds behind INAW, Mike and Alisa, were there giving the membership cards out to attendees. They were confident that we would love it and spread the word! First of all, this is a couple that you just automatically feel like you've been BFF with your whole life after knowing them for approximately two seconds because they're that welcoming in a non-phony way. Secondly, when they tell you they came up with the idea because they love happy hour but hate when it ends... well you wonder why you didn't think of the idea before and like them even more because they had! The program has accumulated what I just counted as 68 bars in NYC and is rapidly growing! Each place has at least one 24/7 discount to offer exclusively to INAW card members. Because of these deals, my roommate, who attended the event with me and got a card of her own, has started plotting a pub crawl that you can essentially plan any day, any time and in any neighborhood... this could get ugly. To answer INAW's favorite question, "Can you handle 24/7 Happy Hour?!" Probably n ot, but that doesn't mean I'm not going to try! Now I just got my card in the mail last week, so I haven't taken it for a spin yet, but I plan to as early as tonight, so best believe I will be reporting back once I do! In the interim, Alisa and Mike were nice enough to give me a discount code that I can give to friends, my tweeps, and followers of the blog. So if you plan on getting a membership card (It pretty much pays for itself the first night you use it with the amount of money you save!) go here and enter promo code "SCAR" for $5 off! Also, INAW is hosting their next "First Fridays" event at Identity on March 5th. You can RSVP here: If you see Mike or Alisa, tell them you heard about them from me! Follow INAW on Twitter for updates on new venues, discounts, and drink specials associated with INAW memberships! 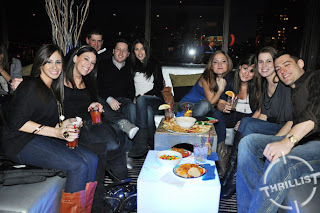 Superbowl photo courtesy of Thrillist.